VODAFONE’S latest figures appear at first glance to vindicate the most powerful management idea of the past two decades: that firms should expand in fast-growing emerging economies. Sales at the mobile-phone company fell in the rich world while those in the developing world rose smartly. Corporate strategy is usually a contentious subject: there are fierce debates about how big, diversified and financially leveraged firms should be. But geography has seduced everyone. Vodafone is one of countless Western companies that have bet on the developing world. Look closer, however, and those figures contradict accepted wisdom. At market exchange rates Vodafone’s sales in the emerging world fell, reflecting the widespread currency depreciations in mid-2013, when America’s Federal Reserve signalled it would taper its bond purchases. This drag may linger: in January the lira and rand tumbled in Turkey and South Africa, two biggish markets for Vodafone. On longer-term measures things look cloudy, too. 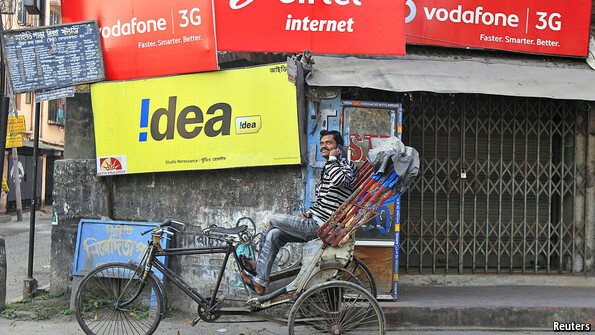 Over a decade Vodafone has invested more than $25 billion in Turkey and India. These operations made a paltry 1% return on capital last year. Vodafone has created a lot of value for its shareholders—but through its American investments, which it has sold to Verizon for a stonking price. This year Western firms’ giant bet on the emerging world will come under more scrutiny. Most multinationals are far more profitable in emerging markets than Vodafone. American firms made a 12% return on equity in 2012, roughly in line with their global average. But having grown fast, profits are now falling in dollar terms. There has been a long bout of share-price underperformance as investors have lost their euphoria. An index run by Stoxx, a data firm, of Western firms with high emerging-market exposures has lagged the broader S&P 500 index by about 40% over three years (see chart 1). And the recovery in the rich world will mean there will be more competition for resources within firms. All this will bring strategic questions into sharp relief. Divisional chiefs from Brazil or Asia will no longer get a blank cheque from their boards. Although the average company has prospered, there have been disasters; plenty of firms and some whole industries need a rethink. The emerging-market rush may end up like a giant version of the first internet boom 15 years ago. The broad thrust was right but some big mistakes were made. The companies suffering a slowdown in profits come in three buckets. Consumer firms including Coca-Cola, Nestlé, Unilever and Procter & Gamble have suffered a gentle weakening in demand and a currency drag. Most are still upbeat about the long term, says Andrew Wood of Sanford C. Bernstein, an analysis firm. Companies in the second bucket face a sharper slowdown. They are in cyclical and capital-intensive industries. Fiat Chrysler’s profits in Latin America, a vital cash cow, halved in 2013. This week Volkswagen and Renault joined the ranks of Western carmakers warning of weak emerging-market sales. Last month Peugeot wrote off $1.6 billion of assets, mainly in Russia and Latin America. Emerging-market sales have fallen at Cisco, a technology firm; its boss, John Chambers, reckons it is “the canary in the coal mine”. Industrial giants such as ABB and Alstom have seen orders falter for infrastructure projects, for example the building of power stations, says Andreas Willi of J.P. Morgan. Those firms with mismatches—costs or debts in firm currencies but sales in depreciating ones—face a nasty squeeze. Margins in emerging markets have halved at Electrolux, which makes fridges and other appliances. Codere, a Spanish firm with an empire of gaming and betting shops in Latin America paid for with debts in euros, is now on life support and restructuring its balance-sheet. In the third bucket are firms with idiosyncratic problems. China’s war on graft has hurt luxury-product makers that have grown fat by selling bling to the Middle Kingdom. Sales at Rémy Cointreau, which makes cognac that Communist Party big-shots quaff, fell by a fifth in the quarter to December, compared with the previous year. Russia’s once-frothy beer market is shrinking as the country conducts one of its periodic crackdowns on alcoholism. All this may be breezily dismissed as short-term turbulence. 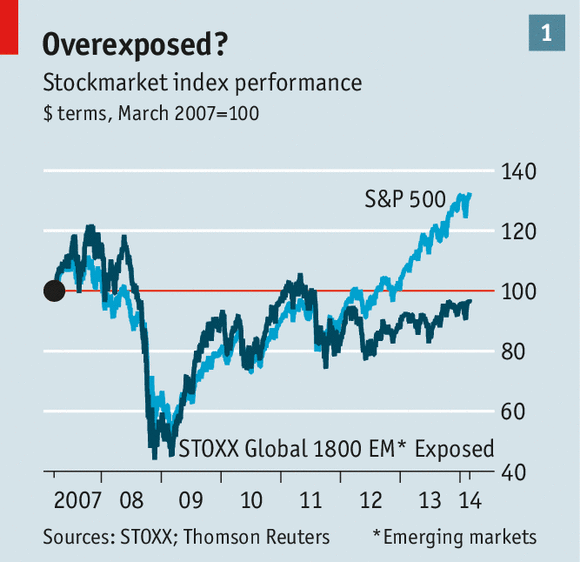 But emerging-market wobbles can have a profound impact on corporate strategy. After the 1997-98 Asian crisis many multinationals tilted back towards the rich world. Citigroup and HSBC, two big banks, played down their Asian heritages and spent the next decade building subprime and investment-banking operations in America. Unilever’s operating profits fell in 1997. It felt obliged to tell shareholders that the rich world was its “backbone” and by 2000 it too had made a huge American acquisition, of Bestfoods. The emerging world’s troubles are not as bad as in 1997-98. But the exposure of rich-world firms is far higher than then (see chart 2). Big European firms make one-third of their sales in the developing world, almost triple the level in 1997, reckons Graham Secker of Morgan Stanley. For big, listed American companies the total has doubled, to about one-fifth. For Japanese firms it is about one-tenth, says Kathy Matsui of Goldman Sachs. The bigger a firm is, the greater its exposure tends to be. Rich-world firms do business across the emerging world, with China accounting for 10-20% of it. Consumer goods, cars, natural resources and technology are the industries with most exposure. Property, construction and health care have the least. Many of these operations pre-date the boom. European firms have footprints in Asia and Africa from colonial times. American firms dominated foreign direct investment (FDI) flows in the 1970s and 1980s. By the 1990s manufacturing firms were creating global production chains. A wave of privatisations in Latin America enticed a new generation of conquistadores from Iberia and North America. But by the mid-2000s the process had accelerated dramatically as executives and boards latched on to the idea of the fast-growing BRICs (Brazil, Russia, India, China) and their ilk. 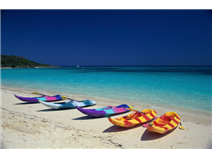 Once the subprime and euro crises began, the urge to escape the Western world was irresistible. FDI into China in 2010 was more than double the level in 1998. Takeovers became common. In 2007 purchases in emerging markets by rich-world firms reached $225 billion. That was five times the level just half a decade earlier. One measure of how discipline slipped is the valuation of those deals. In 2007 rich-world buyers stumped up a dizzy 17 times operating profits for their targets, double the multiple paid in 2000-03. Some firms had unexpected identity changes. Suzuki, a Japanese carmaker, found that its formerly sleepy Indian arm accounted for the biggest chunk of its market value. Portugal Telecom’s Brazilian unit kept it afloat during the euro crisis. Having taken control of a beer firm in St Petersburg, Carlsberg, a Danish brewer, became a “Russia play”. Mandom, an 87-year-old Japanese firm, found itself a giant of the Indonesian male-cosmetics market. Other firms’ efforts to peacock their emerging-market credentials look, with hindsight, like indicators of excess. Having been bailed out for its toxic credit exposures back in America, Citigroup rebranded itself as an emerging-market bank. Schneider Electric, a French engineering firm, and HSBC relocated their chief executives from Europe to Hong Kong (HSBC has since backtracked). Historians may judge the peak of the frenzy to have been in June 2010. Nathaniel Rothschild, a scion of a banking dynasty (some of whose members are minority shareholders in The Economist), raised $1.1 billion for a shell company in London, set up to buy emerging-market mining assets. Months later it invested in Indonesian coal mines with the Bakrie family, known in that country for its political ties and web of businesses. According to Bloomberg, Mr Rothschild shook hands on the deal without visiting the main mine in question, in Borneo. The transaction was a “terrible mistake”, he later admitted. Every corporate-investment cycle creates triumphs and disasters, and a lot of mediocrity. The emerging-markets boom will be no exception. Hard figures are elusive but the book value of the equity that Western firms have invested in the emerging world has probably risen by at least $3 trillion since 1998. This is a colossal sum, equivalent to 11% of the emerging markets’ combined GDP in 2013. Many firms have prospered, such as the banks that braved Mexico in the 1990s. But there is plenty of rot, too. Start with takeovers. There have been $1.6 trillion-worth since 2002. A rule of thumb is that half of all deals destroy value for the acquirer. Like Vodafone, many firms paid dizzy prices justified by pepped-up forecasts. In 2010 Abbott Laboratories, an American drugs firm, paid $4 billion for the small Indian drugs unit of Piramal, predicting it would grow at 20% a year for a decade. Two years later sales were stagnant in dollar terms. Daiichi Sankyo, a Japanese drugs firm, has been badly burned in India, as the company it bought into, Ranbaxy, has hit serious quality problems. Lafarge paid $15 billion for Orascom, a North African and Middle Eastern rival, in 2007. The French cement giant predicted sales would rise by 30% a year. Since then its shares have almost halved, partly due to the crippling debt burden incurred. Big greenfield projects have broken hearts, too. ThyssenKrupp, a German steel colossus, launched an ambitious project in 2006 to make steel slabs in Brazil and process them in America. Rising costs have made it unviable, and most of the $10 billion sunk has been written off. The firm’s boss has labelled the episode a “disaster”. Anglo American, a mining company, buried $8 billion and the career of its former chief executive, Cynthia Carroll, in a Brazilian project called Minas-Rio. Cost overruns have led to a $4 billion write-off. Besides such eye-catching failures, there are pockets of serious underperformance tucked away in corners of sprawling multinationals. Consumer-goods firms have made hay in emerging markets, but even the best have some iffy businesses. Procter & Gamble’s margins outside America are half those it enjoys at home. Profits are weak in India and Brazil, where it is a laggard. A.G. Lafley, who returned as the firm’s boss last year, has promised more discipline. It is the same story with Spanish investments in Latin America. Telefónica makes good money across most of the continent, says Bosco Ojeda of UBS, a bank. But Mexico is a running sore. For 14 years Telefónica has poured in billions of dollars without threatening Carlos Slim, who dominates telecoms there. Even the world’s two biggest brewers, Anheuser-Busch InBev and SABMiller, which have been huge successes, have bought some businesses with low market shares and commensurately weaker profits and returns on capital. In some cases the underperformance is spread across an entire industry. During a boom every firm thinks it can be a winner, leading to excess investment and saturation. The more capital-intensive the industry is, the greater the pain in store for its weakest members. Insurance is a case in point. India has more than 20 foreign firms slugging it out for tiny market shares while bleeding cash. Turkey is also an insurers’ graveyard. Most European firms have a motley collection of emerging-market assets, but only a few, such as Prudential, AXA and Allianz, have scale. “There are trophy markets where everyone has decided they have to be in. Typically they don’t make a lot of money,” says an executive. Some rich-world firms need to take a long, cold look at their emerging-market businesses and work out if they make sense. But there are psychological barriers to this. One is that most Western businesses have low gearing—usually it is only when they have a debt problem that they make difficult decisions quickly. Without their emerging-markets pep pill many firms would have dire revenue growth. 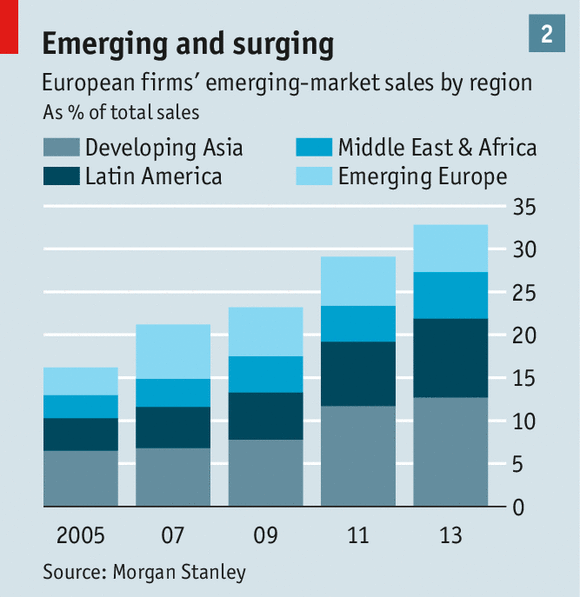 The developing world has supplied 60-90% of the growth of Europe’s big firms in recent years. And a whole generation of chief executives has learned that quitting emerging markets is a mug’s game. Bosses who panicked and left after the 1997-98 crisis ended up looking like idiots. Yet companies should allocate capital carefully, regardless of the spare funds they have. Sales growth without profits is pointless. And comparisons with 1997-98 are imperfect. Most industries have become more competitive, as emerging economies’ local firms get into their stride. The low-hanging fruit is gone. Reflecting this logic, a few big industries have already begun to trim their emerging-markets arms. Exhibit one is banking. After being bailed out, some firms such as ING and Royal Bank of Scotland have largely retreated from the developing world. Bank of America has sold out of its Chinese affiliate. But even big, successful firms which are dedicated to emerging economies are trying to boost returns by trimming back. HSBC has got out of 23 emerging-market businesses. The world’s biggest five mining firms are also adapting to lower emerging-market demand. They have cut capital investment by a quarter since 2012, says Myles Allsop of UBS. The supermarkets are in retreat after decades of empire-building that led them to invest $50 billion in the emerging world. Synergies have proved elusive, local rivals have got stronger and tastes more particular. In Turkey shoppers prefer discount stores to hypermarkets—the four biggest foreign firms there lost money in 2012. Aside from Walmart’s Mexican unit, most rich-country grocers’ operations in the developing world have low market shares and do not cover their cost of capital. Casino, a French firm, has already shrunk, says Edouard Aubin, of Morgan Stanley. He thinks Carrefour could slim down to five countries from a peak of more than 20 (although it said this week it would keep expanding in China and Brazil). Walmart is cutting the number of stores it has in emerging markets. Tesco seems to have abandoned its dream of controlling big businesses in Turkey and China. In the next few years more firms may follow the example of some supermarkets and retreat from the developing world. Most, though, will adapt, cutting capital investment and pruning their portfolios. All this will create opportunities for rising local firms. On February 19th, as Peugeot announced its giant write-off of emerging-market assets, Dongfeng, its Chinese partner, said it would take a 14% stake in the French firm and that technology-sharing between the two would speed up. There are rumours that General Motors may sell its loss-making Indian plant to its Chinese partner, SAIC. In 2011 ING sold its large Latin American business to Grupo Sura, a Colombian conglomerate intent on becoming a regional player. The rich-world firms that remain will need to make their business models weatherproof, not just suited for the sunny days of a boom. That means shifting even more production to emerging markets and borrowing in local currencies—both are a natural hedge against currency turbulence. As others falter, the strongest multinationals are making bolt-on acquisitions. In 2013 Unilever bought out some minority shareholders in its Indian business for $3 billion and Anheuser-Busch InBev took control of Grupo Modelo, a Mexican rival, for $20 billion. The year before Nestlé spent $12 billion buying Pfizer’s baby-food business, which is mainly exposed to the emerging world. Rather than being the panacea envisioned by many Western firms during the boom, emerging markets are governed by the oldest business rule of all—survival of the fittest.